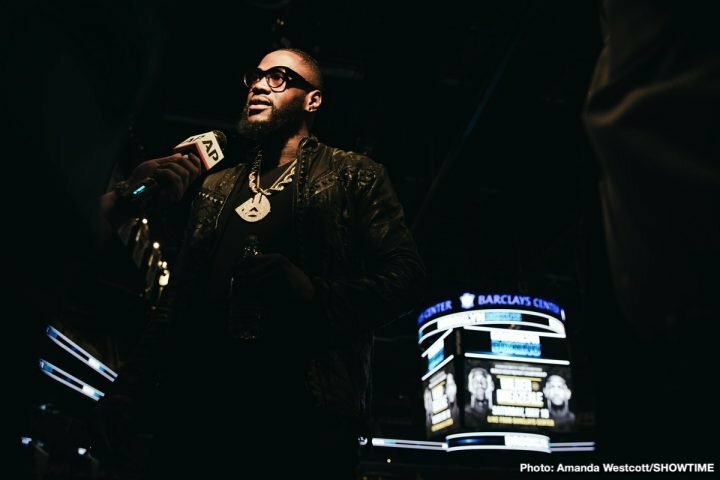 By Allan Fox: WBC heavyweight champion Deontay Wilder recently turned down a reported $193 million deal to sign with DAZN, but he now says he’ll soon be the highest paid athlete in the world. Wilder (40-0-1, 39 KOs) isn’t just talking about being the highest paid fighter in boxing. He’s saying he’ll be the highest paid athlete. Is this realistic? What likely will need to happen before the unbeaten 6’7″ 2008 U.S Olympic bronze medalist takes his career to the next level to become the #1 paid athlete in the world is for him to defeat his next Dominic Breazeale followed by Tyson Fury and then Anthony Joshua. In other words, Wilder, 33, will need to run the table so to speak by defeating two of the best heavyweights in boxing. Before he gets to both of those two, Wilder may need to defeat Dillian Whyte if the World Boxing Council makes the British fighter the mandatory for the winner of Wilder’s next fight against Breazeale (20-1, 18 KOs) on May 18. That might be difficult for Wilder to vault to the top of the world in becoming the highest paid athlete. With Floyd Mayweather Jr. still around, there’s always the possibility that he could dig up a highly popular MMA fighter and beat him in a boxing match. The good news for Wilder is Mayweather appears to be done as far as fighting boxers. Mayweather could make massive money if he came back and fought Saul Canelo Alvarez, but he doesn’t seem at all interested in doing that. Mayweather is satisfied with the smaller, safer, and quicker paydays against MMA guys. Wilder could take Mayweather’s place if he hurries up and fights Joshua and gets a rematch with Fury. Getting a rematch with Fury is out of Wilder’s control now. His new promoters at Top Rank are trying to make him into a star in the U.S by matching him in winnable fights. Top Rank is using an old tried and true method of matching Fury against guys that have a flashy record, but have very little going for them in the talent department. Fury be fighting this summer against German heavyweight Tom Schwarz on June 15 in Las Vegas, Nevada. Top Rank CEO Bob Arum says he wants to make the rematch between Wilder and Fury in 2020, but it remains to be seen whether that’ll happen. Fury probably won’t become popular from one mismatch against Tom Schwarz. The U.S fans aren’t going to be sold on Fury if all Top Rank is going to do is match him up against fighters that have zero chance of beating him. If Wilder can’t get the fight with Fury in 2020, and if Joshua’s promoter Eddie Hearn continues to offer less than a 50-50 deal, then Wilder will need to go after the likes of Dillian Whyte, Adam Kownacki and Joe Joyce. Those are three heavyweights that would likely agree to a fight against Wilder in a second if it were offered to them. Wilder wanted to know how much Joshua (22-0, 21 KOs) would get in a fight against him. Wilder didn’t want to proceed without knowing. It’s unclear how much money a unification fight between Wilder and Joshua will ultimately make. Joshua’s promoter Eddie Hearn believes the money pot will grow a year from now to a lot more than it is now, as long as both fighters continue to win. Hearn is confident Joshua will keep winning, but he has doubts whether Wilder will be able to maintain his unbeaten record for long, given his close calls in his recent fights against Fury and Luis “King Kong” Ortiz. This reign will be EVERLASTING! In the meantime, Wilder must do something about his steadily dropping weight. He’s been losing more and more weight with each progressing fight. Wilder weighed 212 lbs for his last fight against Tyson Fury on December 1, and he was outweighed by 44 pounds by the 256 1/2 pound Fury. That weight was significant, as Wilder struggled with Fury’s size throughout the contest. Wilder now weighs as much as a rehydrated cruiserweight. The cruiserweight division ends at 200 lbs, and the fighters usually rehydrate to 212 to 215 lbs. Wilder has let his weight get too low. He started losing weight four years ago in 2015. After weighing a career high of 229 lbs for his fight against Eric Molina in June 2015, Wilder’s weight has dropped with each of his last six fights. The recent photo of Wilder that he posted on his Twitter site showed a fighter that looked painfully thing for a heavyweight. Wilder looked more like a basketball player than a heavyweight in the photo. He needs to start eating more, and lifting weights the way that Anthony Joshua, and all the heavyweights do. Wilder can’t end up down at 200 lbs, trying to fight guys that are in the 245 to 256 region. That’s not going to work. If Wilder wants to fight at cruiserweight, he could do that easily, and then it wouldn’t be an issue for him, as long as he doesn’t keep losing weight. If Wilder’s steadily dropping continues to follow this trend, we’ll see him at 210 lbs for his fight against Breazeale on May 18. That’s not good obviously, because weighs in the neighborhood of 256 lbs for his fights. If that weight holds true, Breazeale will have close to a 46 lb weight advantage over Wilder if he drops down to 210 lbs for that fight.